The fuzzy Republican math around education funding is starting to become more clear. In the days leading up to and following the passage of the state’s budget and the close of the legislative session, there was a lot of debate about how much money K-12 schools could or would get. This argument was mired in semantics. But House Democrats think there is one question that gets to the heart of the matter: How much new money will go into our classrooms? After years of deep budget cuts, our classroom sizes are getting larger, teachers are leaving the state and some schools are using 15-year-old textbooks. 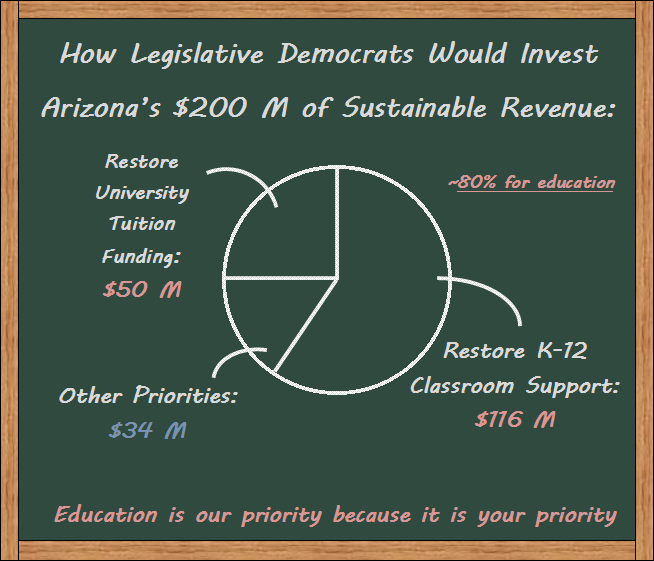 The way to change that is to make sure we are investing resources directly into Arizona classrooms. Regardless of all the other budget numbers being discussed, classroom funding is the number that matters. Arizona remains at the bottom of the barrel nationally for per pupil spending and that needs to change. 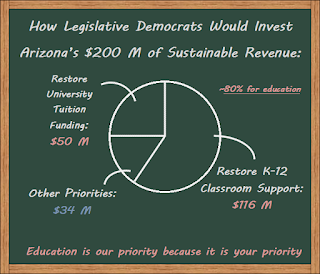 Democrats wanted more for Arizona students and we will keep fighting until we get it.